Submitted photo Owner Rose-Marie Bradley announces the addition of floral arrangements to Country Blessings. XENIA — A dream and a crafty touch blossomed into a country store and now that store is offering flowers as well as gifts. “Today, the dream of a cute little country store has grown and is bursting at the seams with flowers and gifts,” said owner Rose-Marie Bradley. When the previous owners retired, so did some of the items they carried but over the past few years the collection of items has now grown and expanded. “Country Blessings carries a unique line of items that you can’t find just anywhere because they are truly one-of-a-kind,” said the owners Andy and Rose-Marie Bradley. Handmade, homemade, locally made and sold in the store, the gifts available vary from country, primitive, and antique to shabby chic, vintage, new and now flowers. The Bradleys are celebrating their five-year anniversary of ownership and expanding their services to offer flowers. The flower business runs deep in the family as Grandmother, Clarice, worked for Wickline’s florist for 25 years. Before she went to work for the Wickline family, she worked side by side with mother, Diana, and father at their flower shop. And they used to own a flower shop. The current owners also worked at Wickline’s in their younger days. 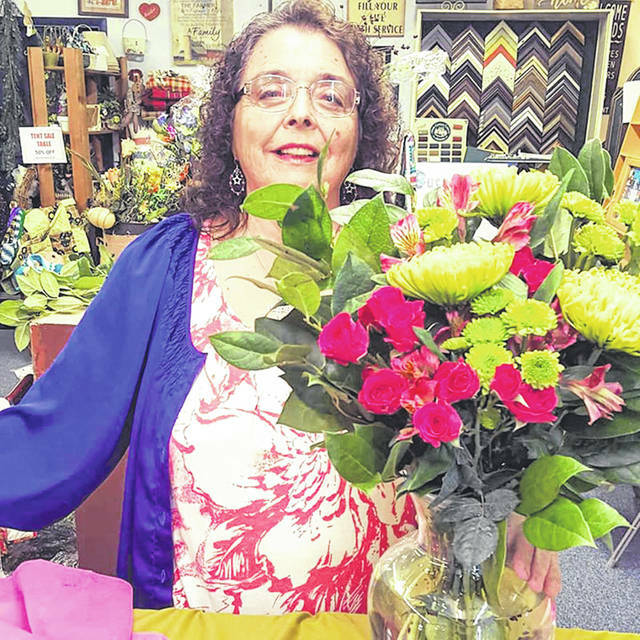 “Sometimes in life things come back full-circle and after hearing about Wickline’s retiring, it seemed only right to bring the flower shop into the gift shop business,” said the Bradleys. They shop added a new member of the family and 25-year veteran Wickline’s designer, Lisa Parks. “She will be a great fit and make some phenomenal arrangements,” said Rose-Marie. Country Blessings Flowers and Gifts is now a full service flower shop making arrangements for all occasions. Pick-up or delivery available. A grand opening celebration will be held during Old Fashioned Gathering 10 a.m. to 6 p.m. Saturday, Sept. 15, 491 W. Second St. For more information visit the store online www.countryblessingsohio.com, Facebook and Instagram. Hours of Operation are 9 a.m. to 6 p.m. Tuesday through Saturday. https://www.beavercreeknewscurrent.com/wp-content/uploads/sites/49/2018/09/web1_Blessings.jpgSubmitted photo Owner Rose-Marie Bradley announces the addition of floral arrangements to Country Blessings.